The patient is a 55-year-old woman with a history of bilateral ureteronephrectomy in 2010 for high grade urothelial carcinoma. The kidneys were grossly and histologically unremarkable. The ureters both demonstrated transitional carcinoma of the usual type. Routine follow-up repeatedly resected tumor of the same morphology from various anatomic locations throughout the bladder. Recent biopsy of the bladder demonstrates sheets of clear cells with scattered blood vessels. 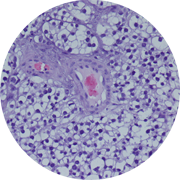 Of notable absence is the delicate intervening vascular network typically seen in renal cell carcinoma, clear cell type. The patient's archived material is reviewed and a single glass slide/tissue block contains a small focus of tumor with similar histomorphologic features. Immunoperoxidase stains show that the neoplasm is positive for E-Cadherin, p63, and Thrombomodulin and negative for RCC and PAX-8. The diagnosis is high grade urothelial carcinoma with clear cell features.